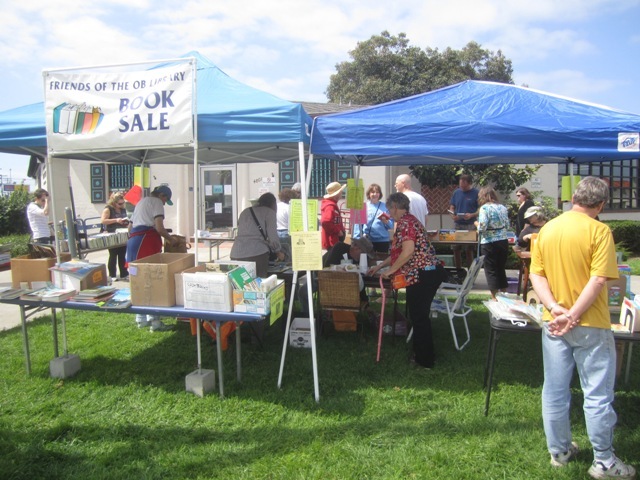 The Friends of the OB Library held a book sale on Saturday, the 22nd of March, and their record-breaking success proves that books are still cool, and have not gone the way of the 8 Track Cassette. Not yet. 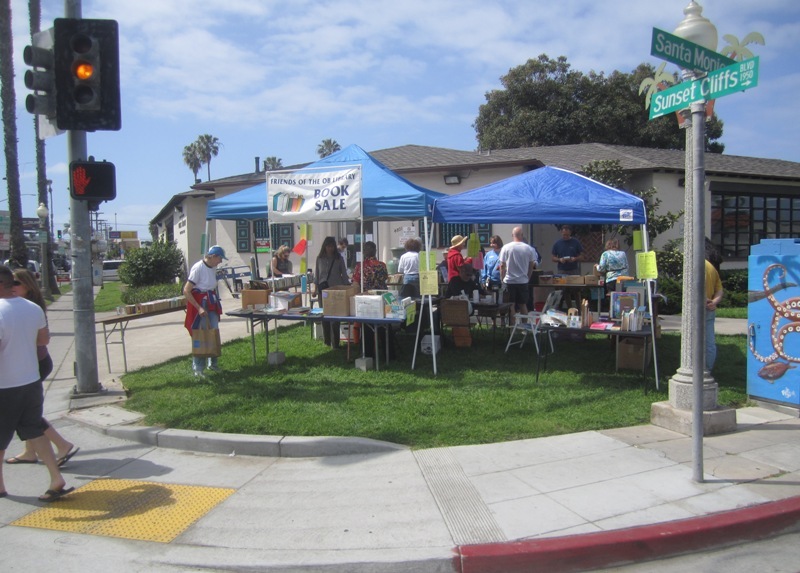 For over 3 hours, the volunteer team headed up by president Judy Collier did their work on the green in front of the old branch that serves Ocean Beach. And the Friends have announced that they made $645.75 during their sale. The volunteers of the Friends of the OB Library. (From L to R:) Paula, unk, Judy, Tony, George, unk, unk, and Suzi. This money will pay for books, materials, programs, and equipment for the historic library. The reasons for the success are several, we have been told. This year the volunteers spent hours and did a major organization of their great selection of books, DVDs and CDs which helped browsers select their choices. Also they received new-looking tomes from the non-profit San Diego Book Project as well as other San Diego Library Friends chapters. It helps to have a full and varied selection. 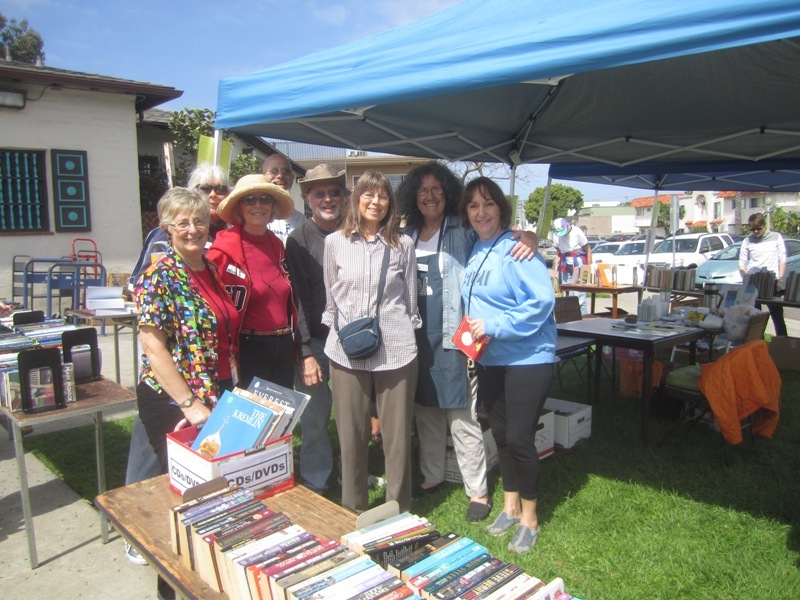 Plus the Friends of the OB branch receive many donated books from OBceans. And lastly, volunteers thought that the OB Rag coverage of their event also helped. If you love the OB Library, please, please, be sure your library card is up to date and check out a few books. If you are all set up, the system will send you an email before they are due, solving the pesky over-due-library-book problem. The City looks at books checked out to determine library utilization. And loving the library doesn’t work in their equation. In addition to buying a book, take some time to stop in and check one out. Coming by the book sale on Sat., I brought 2 books donated by my roommate – which were snatched up right away, and then I left with 12 books. A net gain of 10. Or loss depending on how you look at it. It’s everyone’s gain, Frank. You bought the books, the library will use the money we made, and when you finish with them you can re-donate them! It was good to see you there. Thanks for your support. Newer Article: What Will Happen to Pumbaa, the Shar Pei?